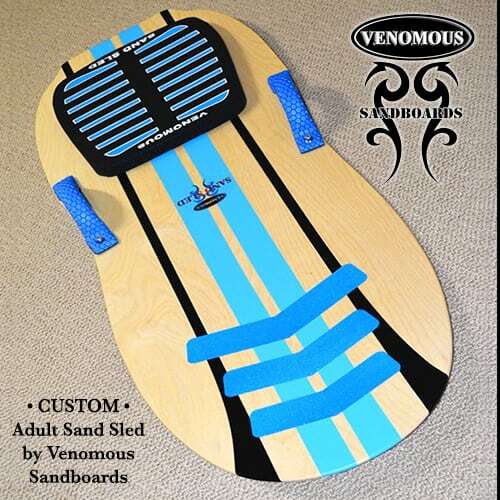 The Venomous ‘adult’ Sand Sled is made with sturdy hardwood ply and black Race Base bottom. The adult sled is a bit longer and wider for adult passengers. All of our Sand Sleds come complete with comfy 1″ closed cell foam seat cushion, grip tape foot placement and 2 rubber grip covered side handles. Sand Sleds are light weight, fast and a lot of fun for those who prefer to sit down to ride the dunes. Clear poly coated natural wood finish is standard but racing stripes can be added for a custom look! The Adult Sand Sled is shipped to you along with Dr.Dune’s famous sandboard wax and is ready to go! 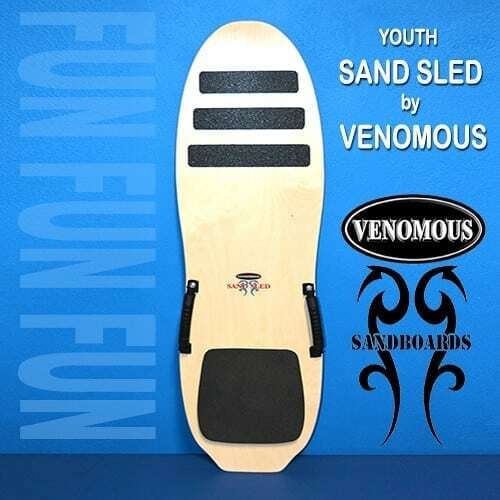 This is the original ‘ADULT’ Sand Sled by Venomous Sandboards. 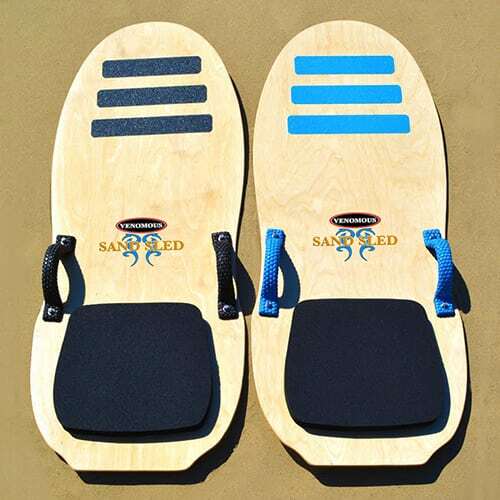 Sand Sleds are hot pressed with a high pressure press durability and flex. Made with sturdy maple/birch hardwood ply and laminated with a white ‘Race Base’ underside. Adult sleds are longer and wider than youth size sleds to accomodate adult passengers or even two smaller passengers. 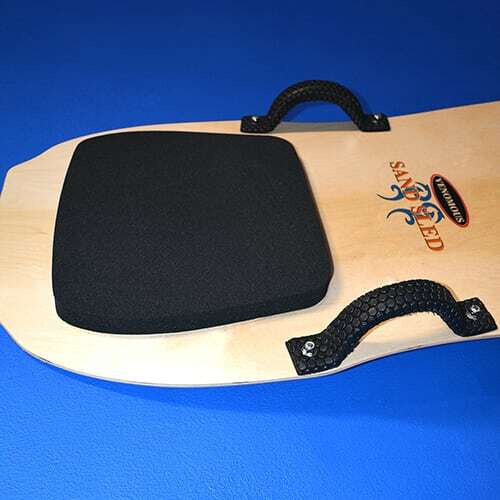 All of our Sand Sleds come complete with comfy with a 1″ thick human weight crush proof closed cell foam seat. Industrial grade grip tape foot placement helps hold the rider. 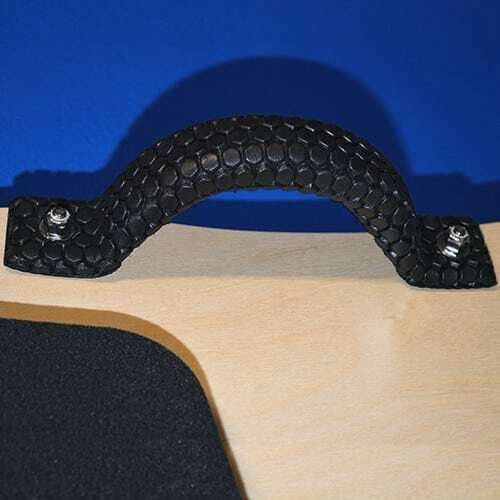 Two inovative rubber grip side handles ( black or blue ) added for solid support and maneuvering. Sand Sleds are light weight, fast and a lot of fun for those who prefer a sit down ride! The side cut design allow for better maneuvering and the wide nose funnels more air under the sled for better, FASTER glide of the sand. Clear poly coated natural wood finish is standard. However, racing stripes and/or blue and red color grip tape can be added for a custom look! 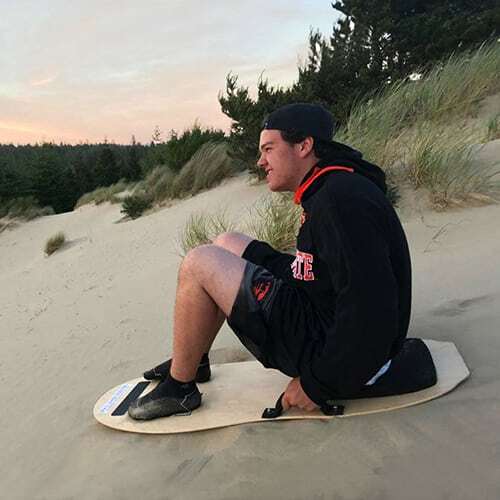 You can try the full line of Venomous sand sleds and sandboards at the world’s first sandboard park, Sand Master Park, Florence Oregon USA. Sand Sleds are a lot of fun for a lot of years to come! 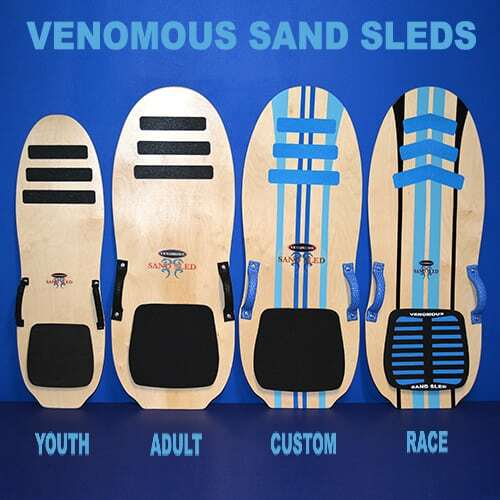 Venomous produces two sizes of Sand Sleds, adult and youth. While weight isn’t a real factor, length of the adult sand sled is more appropriate for riders 5′ and taller. Sand Sleds ( as well as sandboards ) have a break in period while the sand polishes out the new base smoother and smoother. Start with a 20º angle and just keep sliding. You will notice the improvement in glide usually with each ride.